Kingdom Hearts is difficult to follow, and I’m not just talking about its needlessly disorienting plot. The two main entries in the series came out on the PlayStation 2 in 2002 and 2006, respectively, but that’s far from the whole picture. Side stories, prequels, interquels, and game-spanning dream sequences set in the Kingdom Hearts universe have come out on the Game Boy Advance, Nintendo DS, Nintendo 3DS, and Sony PSP, and each entry contains at least some information vital to understanding the series’ overall story. Square Enix seems hell-bent on releasing a Kingdom Hearts game for everything that runs on electricity. 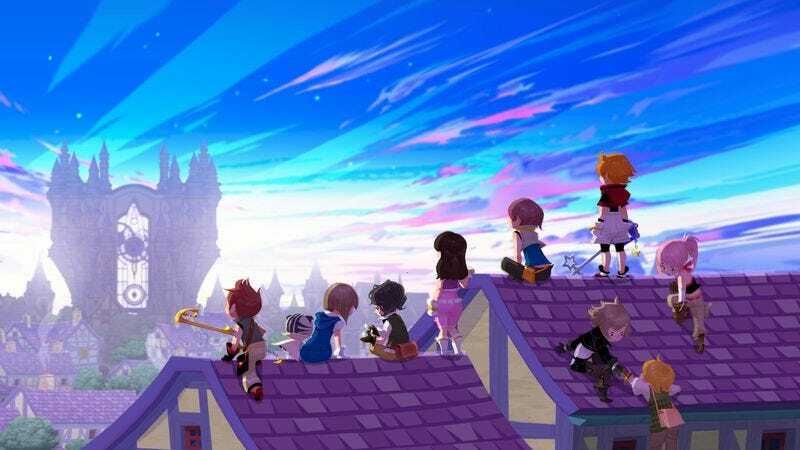 This past month, the latest Kingdom Hearts finally saw a release in North America, this one taking the form of an Android and iOS app, of all things. Kingdom Hearts Unchained X (pronounced “Unchained Key” for reasons too convoluted to get into here) is the mobile version of a Japan-exclusive browser game, and it bears all the hallmarks that have come to typify free-to-play releases. It tasks players with creating themselves an avatar, then tackling a series of bite-sized quests and managing multiple resources that can be spent on improving your character’s stats and abilities. These can be either earned by jumping through various hoops or purchased outright with real money. It is, in many ways, a paint-by-numbers, micro-transaction-driven mobile game. It is also very much a Kingdom Hearts game. This isn’t a farmed-out cash grab with a bit of branding slapped on top. It was developed, at least partially, in-house at Square Enix and directed by series maestro Tetsuya Nomura. It even has a place in the overarching Kingdom Hearts storyline and is supposedly intended to help set up the upcoming Kingdom Hearts III. Smartly, Unchained X attempts to sidestep much of the series’ baggage by telling a prequel story, a strategy also used in series highlight Birth By Sleep. Unchained X is set a full 100 years prior to the events of the original Kingdom Hearts, in a time period when Keyblades—the mystical weapons wielded by series protagonist Sora and some of his cohorts—were two-for-a-penny trinkets equipped by hundreds of plucky heroes. Eventually a cataclysmic event called the “Keyblade War” would end this period of Keyblade surplus, so I suspect that learning more about this piece of lore is the game’s raison d’être. That’s the beauty of Kingdom Hearts: Even in its deliberate attempts to tell simple stories that are free from the series’ impenetrable mythology, it still ends up writing itself into corners. I’ve been playing Kingdom Hearts Unchained X for about two weeks now, and despite being a whopping 75 missions into the story, I’ve still barely uncovered anything. These mobile games are clearly meant to be marathons, not sprints, so I imagine I’ll be playing it for a while yet. Still, it’s comforting to have a little bit of new Kingdom Hearts action to keep me company until the third main entry finally comes out. Unchained X has just about everything you could expect of a Kingdom Hearts game but in miniature: miniature Keyblades, miniature Heartless monsters, miniature Disney heroes, and of course, miniature plot holes. If the game is set 100 years in the past, how come you can run into Donald and Goofy? Are they supposed to be over 100 years old? Never change, Kingdom Hearts.